I am so ready for Spring! I am so looking forward to seeing spring flowers. I was tickled pink when a friend gave us these daffodils to support our fight. At the same time, I was working on Arlette's Wired Edged Flowers tutorial. I just love the fact that I can use up my favorite fabric color scraps from quilting! 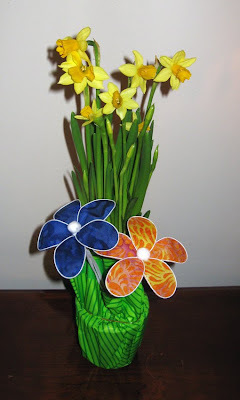 Here's my version of the brightly colored wire edged flowers. I added a pom pom in the center of each flower for some fun. 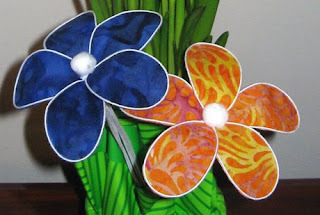 You should try these, they are so cheerful and easy to make! Gorgeous! Love the pretty fabrics you've chosen. I'm glad that you enjoyed the tutorial!